The casino at Corona Resort and Casino, on Phu Quoc island, is to open on Saturday, confirmed to GGRAsia the entity managing gaming at the venue. The source added that the casino would be the first in Vietnam to allow eligible locals to gamble, immediately upon launch. “We plan to open for business, including local citizens of Vietnam from the evening of January 19,” Daniel Kupsin, managing director and chief executive of Upffinity Gaming Management BV, told GGRAsia. Netherlands-based Upffinity Gaming was – according to its management – appointed in 2017 by the Phu Quoc Tourism Development and Investment Company JSC, a Vietnamese property development and real estate firm, to provide “casino management and advisory services” for Corona Resort and Casino (pictured in an artist’s rendering). Phu Quoc Tourism Development and Investment is controlled by Vietnamese conglomerate Vingroup. All supporting amenities within casino premises – including restaurants and entertainment outlets – will be available for public use starting on Saturday, Mr Kupsin told GGRAsia. He added that the gaming venue was designed by U.S.-based architecture practice Steelman Partners LLP, which has been involved in the design of several large casinos in Asia and elsewhere. Phu Quoc is only 68 kilometres (42 miles) – as the crow flies – from Sihanoukville, an expanding casino hub in neighbouring Cambodia, although in practice travel between the two places is currently only possible via a combination of road transport and ferry, and is time-consuming according to travel guides available online. According to a corporate presentation of the property, Corona Resort and Casino on Phu Quoc includes hotels, a theatre, a golf course, an amusement park and a safari park. Mr Kupsin told GGRAsia the non-gaming amenities were already operational. The two-floor casino, with a total area of 18,800 square metres (202,361 sq feet), will be open round the clock, management said. According to the corporate presentation, the casino includes a total of 100 gaming tables, offering eight kinds of games such as baccarat, roulette, blackjack, sic bo and several forms of poker. It also has 1,000 slot machines, and close to 1,000 electronic gaming machines and similar. Corona Resort and Casino is reportedly one of the two first properties in Vietnam to be allowed by the government to offer gambling to economically-qualified locals, under a long-flagged three-year trial scheme. The other is expected to be located in Northern Vietnam at Van Don. The Van Don project is reportedly being developed by Vietnam’s Sun Group. It is located in a remote area around 160 kilometres east of Hanoi. 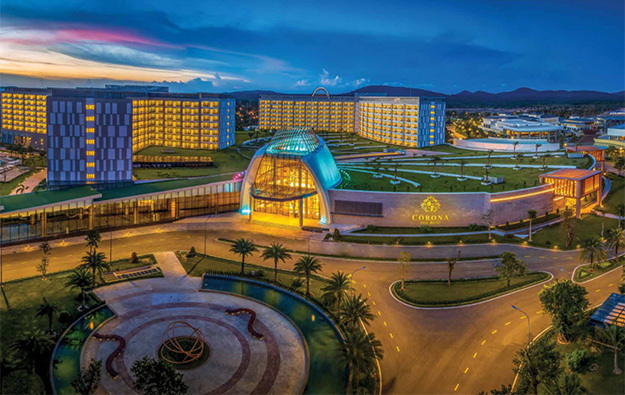 Online media VnExpress reported in November that the People’s Committee of Kien Giang Province – where Phu Quoc is located – had announced that the country’s Prime Minister Nguyen Xuan Phuc had approved in principle the inclusion of a casino in the Corona resort. It added the overall investment in the project – including the casino portion – was now set at VND50 trillion (US$2.14 billion). The government lifted a ban on Vietnamese gambling in casinos in March 2017, following a decree in January 2017 allowing a trial project for gambling by economically-qualified locals at certain venues. Vietnamese customers must be older than 21 and have a monthly income of at least VND10 million; they also need to pay an entry levy in order to gain access to casino floors. Only casino resorts with a total capital investment of at least US$2 billion – including gaming and non-gaming facilities – are eligible to welcome Vietnamese to gamble.